The Dr. Seuss SUPER Kit is back in ACTION! No American writer has had as great an impact on children’s literature as Dr. Seuss. His imaginative characters, vivid illustrations, and catchy rhymes are instantly recognizable to anyone who grew up reading his stories. 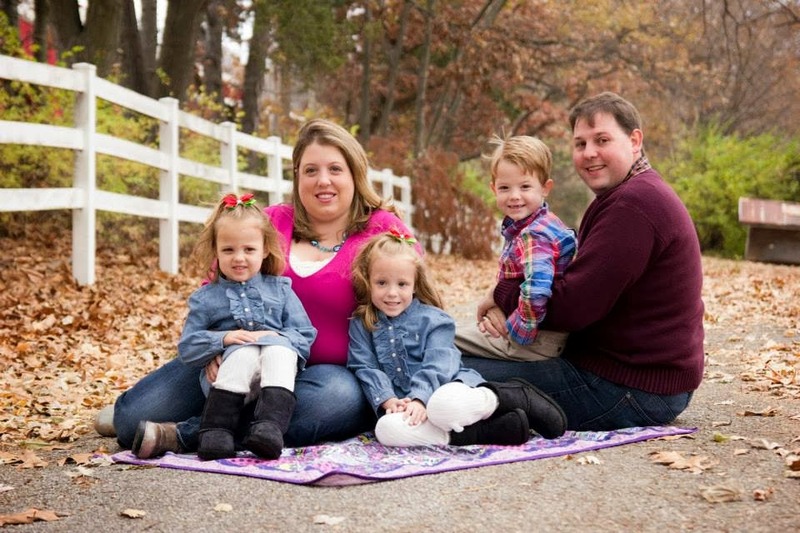 Create a personal library of children’s books by joining Dr. Seuss & His Friends book club. 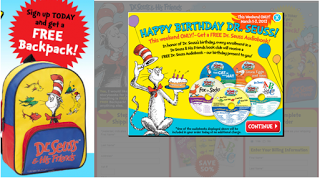 Here is a Super Deal on on a Dr. Seuss Backpack AND FIVE (5) Dr. Suesss Books AND FREE Audio Book for only $5.95 + FREE Shipping! There are only a limited number available, so hurry and grab it while it’s available! Here’s how to get yours . 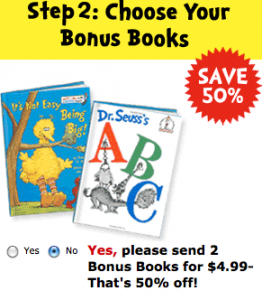 . .
1) Head over HERE to sign up for the Dr. Seuss Book club (Please Note – this is NOT the normal “book club” where you are committed to purchasing more books – you will just need to cancel after you get you get your first shipment as stated below). 3) You can also choose to order two more books OR you can “Uncheck” the box (as seen below) to not add the 2 other books making your total $5.95 for 5 books and a backpack shipped. These also make great gifts! Keep some for yourself and have a few for gifts! INCLUDES: The Cat in the Hat, Mr. Brown Can Moo, Ten Apples On Top, Go Dog Go! & The Tooth Book – Free colorful Cat in the Hat Backpack to carry all your books in. – Free shipping. – Free Dr. Seuss & His Friends Audiobook read by Jason Alexander, David Hyde Pierce or Kelsey Grammer.